In my previous post, I shared my opinion of the fabulously popular Christian interpretation of American history authored by the late Peter Marshall Jr. and David Manuel. The Light and the Glory, From Sea to Shining Sea, and Sounding Forth the Trumpet–often packaged together as the “God’s Plan for America” Series–have reportedly sold nearly a million copies combined. If correct, this surely makes the trilogy the most widely read Christian interpretation of U. S. history ever written. As I mentioned, there are aspects of these works that I admire. They are written in narrative prose accessible to a broad audience. They speak to larger questions of being and purpose, acknowledging our natural human longing for something more than the detached perspective of the academic technician. Finally, they take God’s sovereignty over human affairs with admirable seriousness. And yet their flaws overshadow these strengths. Although I think they are incorrect in many of their factual assertions, I am more concerned with the basic structure of their argument. Simply put, Marshall and Manuel grounded their scriptural critique of the American present in a historical interpretation of the American past. Although I am sure that they meant well, such an approach had three negative consequences. First, it fed a widespread temptation among American evangelicals to conflate our identity in Christ with our identity as Americans. Second, it reinforced a tendency among well-meaning believers to impute a degree of moral authority to the Founding Fathers than can border on idolatry. Finally, by grounding their religious argument so squarely in their own subjective interpretation of American history, Marshall and Manuel placed themselves in a predicament: any challenge to their assertions about the American past would seem to weaken the force of their Scriptural argument about the present. In a sense, they unwittingly allowed the authority of Christian principles to depend on the veracity of their historical claims. This was not malevolent. It was, however, appallingly misguided. I have focused exclusively on Marshall and Manuel thus far, but we evangelicals frequently adopt this historical approach when we try to do battle with the unbelieving culture around us. David Barton has recently come under a microscope for they way that he has wielded his interpretation of American history as a weapon in the culture wars, but he is only the latest in a long line of Christians (almost always non-historians) who have pursued such a strategy. In the rest of this post, I want to speak to a contemporary of Marshall and Manuel who fashioned a far more sophisticated historical argument but without escaping the same unfortunate consequences. The person I have in mind is the late evangelical writer and thinker, Francis Schaeffer (1912-1984). If you are not familiar with Schaeffer and want to learn more, the best place to begin is with Baylor Professor Barry Hankins’ wonderful biography, Francis Schaeffer and the Shaping of Evangelical America (Eerdmanns, 2008). You can make a compelling case that, from the 1960s through the mid-1980s, no single individual did more than Francis Schaeffer to encourage American evangelicals to take the life of the mind seriously. And yet Schaeffer ultimately fell into the same trap that ensnared Marshall and Manuel. His early works contained an historical dimension, but they touched lightly on the American past and did not culminate in a clear call to action. Beginning in the mid-1970s, Schaeffer penned a series of books that developed his historical arguments further and sounded a clarion call for Christian activism. What concerned him most was Americans’ growing devaluation of human life, revealed in their acceptance of abortion and openness to euthanasia. Collectively, How Should We Then Live? (1976), Whatever Happened to the Human Race? (1979), and A Christian Manifesto (1981) constituted “a call to culture war,” as Hankins puts it. Writing at approximately the same time, Marshall and Manuel had explained the sad moral state of the nation in terms of a falling away, a forgetting of God in times of prosperity reminiscent of ancient Israel. Schaeffer’s take was different, if not incompatible. With sweeping generalizations that drove professional historians crazy, Schaeffer explained two thousand years of western intellectual and cultural history in terms of a struggle between world views. On the one hand is theism. This world view begins with “the God who is there” and understands mankind’s existence and purpose in the light of His revelation. Its irreconcilable antithesis is secular humanism–materialistic, relativistic, nihilistic–a world view that exalts autonomous Man as the center of the universe and the definer of meaning. Focusing on the last five hundred years, Schaeffer condemned the intellectual currents of the Renaissance and Enlightenment for embracing secular humanism. Thankfully, their disastrous potential had been held in check, at least partially, by the beneficent influence of the Protestant Reformation and its re-invigoration of Christian theism. But the threat posed by secular humanism persisted, and it was growing. Schaeffer’s primary goal was to pierce the hearts of his readers by engaging their minds, warning them that a culture that embraced relativistic humanism had forfeited any coherent basis for defending the preciousness of the individual. Once transcendent principle had been abandoned, power alone remained, and the society that took such an ominous step had laid itself bare to the inroads of authoritarianism and tyranny. I agree. Unfortunately, just like Marshall and Manuel, Schaeffer insisted on grounding his religious critique of the American present in a historical interpretation of the American past. Like Marshall and Manuel, albeit with different emphasis, Schaeffer told Americans that the United States had begun as a Christian country. Placing the greatest stress on intellectual currents, as was his habit, Schaeffer argued that the influence of the Enlightenment on the Founding Fathers had been negligible. Rather, they had been primarily shaped by Reformation thinkers. In calling on Americans to renounce secular humanism, Schaeffer said they need merely return to the foundation on which the nation had been built. It was at this point that leading evangelical historians began to register their concern. 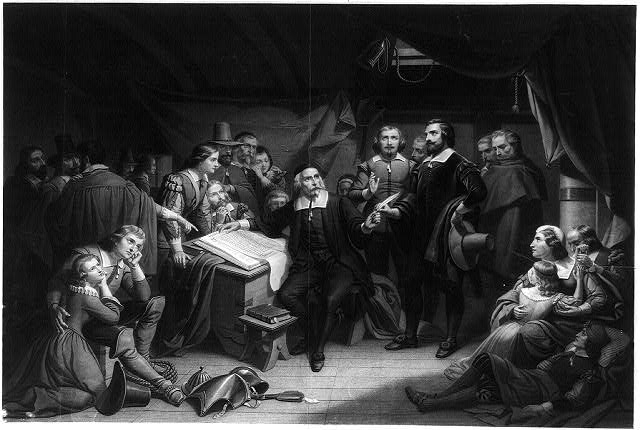 For Christian scholars like Mark Noll (then at Wheaton) and George Marsden (then of Calvin College), the claim that the Founders had been untouched by the Enlightenment ignored extensive evidence to the contrary, whereas evidence that they had been formed by Reformation thinkers was almost non-existent. Now is not the time to address the question of whether the United States was founded as a Christian country. (If you would like to dive into that huge question, a good place to start would be John Fea’s Was American Founded as a Christian Nation?) For now, what we need to see is the corner that Schaeffer had backed himself into. Out of a deep religious conviction, he had gone forth to confront the culture about the implications of its secular world view, but in his approach he had so intertwined scriptural and historical arguments that any disagreement with the latter seemed to undermine the former. As Barry Hankins’ biography relates, for more than a year, Schaeffer, Noll, and Marsden engaged in an extensive correspondence over the accuracy of Schaeffer’s historical claims. Much of the interaction revolved around specific historical points, but another recurring thread in the correspondence centered on Schaeffer’s contention that in publicly challenging his historical interpretation, Marsden and Noll were effectively, if unintentionally, giving aid and comfort to the enemy. American evangelicals who read such words should shudder. Despite the best of intentions and the most genuine of convictions, Schaeffer had so confused his own subjective interpretation of history with the authority of Christian principles that the two had become inseparable. After nearly two generations of culture war, we are inured to a perpetual bombardment from talk show hosts and pseudo-celebrities who implore us to equate fidelity to Scripture and faithfulness to Christ with a particular interpretation of American history. The result has been to add a man-made layer to the “good news” and to make it harder, not easier for us as Christians to think deeply about the culture we inhabit. Let us be very careful in how we appeal to the past. 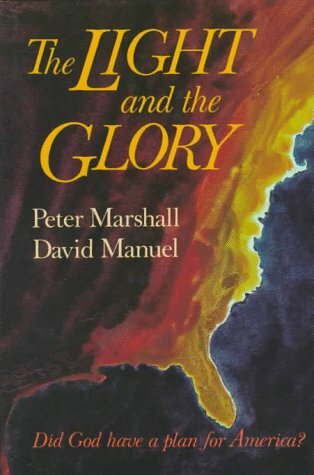 A reader of this blog recently contacted me (offline) to ask my opinion of the book The Light and the Glory, by Peter Marshall Jr. and David Manuel. Although I answered her privately, her question is so important that I think it merits a more extended answer here. The Light and the Glory is arguably the most popular Christian interpretation of U. S. history ever written. It makes sense to share a few thoughts about it, given that this blog is devoted to the question of what it means to think Christianly and historically about the American past. Many of you will already know of this work, but for those you who aren’t, here’s a bit of background. First the authors: A graduate of Yale University and Princeton Theological Seminary, the late Peter Marshall Jr. was a prominent Presbyterian minister and the founder of “Peter Marshall Ministries,” an organization created to remind Americans of their Christian heritage and “restore America to its Biblical foundations.” Marshall’s co-author, David Manuel, was an editor at Doubleday Publishing Company before turning to full-time writing. Next, their published works: In addition to numerous lesser writings, Marshall and Manuel authored three major works, The Light and the Glory, From Sea to Shining Sea, and Sounding Forth the Trumpet. The first, published in 1977, offers an overview of American history from the voyages of Columbus through the establishment of independence from Britain and the creation of the Constitution. The second and third, written over the course of the next two decades, sketch the history of the nation from the creation of the Constitution to the eve of the Civil War. Although the authors went on to produce simplified versions of these works for younger readers, all three books in their original versions feature engaging, accessible prose suitable for juvenile readers on up. This versatility has assured for them a wide readership among adults and a popular and enduring place in the curriculum of private Christian schools and home schools. Their combined sales now supposedly approach one million copies and, if correct, this would make the authors far more widely read than any currently living academic Christian historian. Before offering my own critique, let me stress that there is much that I admire in these works. Professional historians could learn a thing or two from Marshall and Manuel. They took the craft of writing seriously. They understood that historical knowledge, to make a difference in the world, needs to end up between the ears of general readers. (We academic historians too often think of history as a conversation among ourselves.) Marshall and Manuel also appreciated that history is, above all, a story, and they intuitively understood the power of narrative to convey important truths. This is something historians in the Academy used to realize but have long since forgotten. Finally, I have no doubt that Marshall and Manuel had good intentions. Although I have known neither personally, I can imagine that it took courage to take the stand that they did. I suspect that they were on the receiving end of more than their share of criticism and condescension from the surrounding culture. I have certainly never been as bold as they. That said, I would not recommend these books. They are marred by numerous errors of fact and interpretation, far too many to catalog here. These do not constitute their fatal flaw, however. The fatal flaw in these works is the authors’ well-meant but misguided decision to ground their religious critique of the contemporary United States in an historical argument about the American past. Let me elaborate briefly. As they explain in the introduction to The Light and the Glory, when Marshall and Manuel began writing in the 1970s, they were looking for an explanation for the moral crisis that they believe gripped the nation. Surveying the national landscape, they saw a once unified nation now bitterly divided over Vietnam, bitterly disillusioned by Watergate, and succumbing to a variety of moral ills such as mounting divorce and sexual permissiveness. As Christians heartbroken over the trajectory of their country, they sought an explanation. More specifically, as Christians interested in history (Marshall had been a history major at Yale), they sought an explanation in the past. Note that most, though not all, of their argument was historical. Marshall and Manuel’s insistence that God had a special plan for the United States was not a historical conclusion at all. It was a prophetic declaration, a fact that the authors should have been more forthcoming in acknowledging. This important exception aside, their interpretation rests squarely on a series of historical claims having to do with the values of the country’s founders and the degree to which succeeding generations did or did not conform to them. There were other possible approaches. As a pastor, Marshall simply could have opened his Bible. Employing scriptural principles as a plumb line, he could have instructed his congregation (and any other audience that would hear him) in the ways that current American values fell short of the scriptural standard, in effect calling them (and the nation) to repentance. What he and Manuel did, however, was to intertwine that call to repentance with a historical narrative—not a narrative based on divinely revealed biblical history, but a narrative based on the authors’ interpretation of American history. Why did they do that? I don’t know what their motives were, but there are two reasons why I think well-meaning Christians in general so frequently do something similar. First, it may seem to strengthen our argument to other Christians. When we buttress a religious argument with an interpretation of American history, we simultaneously appeal to two aspects of American Christians’ identity, namely their Christian faith and their American heritage. Whether they consciously intended this, this is what Marshall and Manuel were doing. They were calling their audience back in not one, but two respects: back to Biblical principles, and back to the supposed ideals of the American founding. Second, well-meaning Christians may also inject historical arguments in their efforts to reach non-Christian audiences in the public square. For example, in evaluating the moral state of the nation in the 1970s, Marshall and Manuel might have observed that the United States was rejecting God’s standard and simply left it at that. Their assertion might have pierced the hearts of some believers, but what weight, humanly speaking, would we expect it to have with the broader, unbelieving culture outside the church? Eventually, Christians who want to have a political impact in the public square always have to confront a momentous question: Do we ground our arguments solely in explicitly religious principles, or do we seek some sort of “common ground” on which to build arguments that non-Christians might be more open to? I am not claiming that this is what motivated Marshall and Manuel, but this much is clear: appeals to the American past are one frequent way that American Christians try to influence the contemporary culture without making explicitly religious arguments. So why was it such a bad idea for Marshall and Manuel to support a religious critique of contemporary America with a historical argument about America’s past? I can think of three reasons. First, their approach exacerbates an identity crisis that has long plagued American Christians, American evangelicals especially. It is always dangerous to link our commitment to Christ too closely with one or more of our other group attachments. And there is always a temptation to do so. It is so easy to intertwine our faith with adherence to a particular social cause, economic system, approach to education, or political party, for example. When the boundaries between these loyalties become blurred, we fall prey to what C. S. Lewis in The Screwtape Letters called “Christianity And.” By “Christianity And,” Lewis had in mind a state of confusion in which our ultimate identity in Christ becomes inseparable from other kinds of loyalties that can actually take preeminence in our hearts. When it comes to thinking about the past, I think that “Christianity And” is most often a concern when we grapple with what it means to be both a Christian and an American. The Marshall and Manuel approach merely feeds this temptation. Second, there is a way in which the linking of religious argument with historical interpretation can unintentionally promote idolatry. That’s a strong statement, I know, and I want to stress that this was never Marshall and Manuel’s conscious intent. In fact, here I have Marshall and Manuel less in mind than more recent writers who regularly appeal to the founders in making arguments about contemporary public policy. Living as we do in a pluralistic society suspicious of anything that looks like “theocracy,” I understand why it is so tempting to make such arguments. Advocating that the nation return to the supposed principles of our founding seems like an acceptable way to promote Christian values in public life without making explicitly religious arguments. The problem with this approach, however, is that it gives moral authority to the founders of our country, and that is simple idolatry. The founders deserve our respect, unequivocally, but when “What would the Founders do?” becomes a proxy for “What would Jesus do?” we are imputing moral authority where God has not granted it. That is idolatry. There’s no other word for it. Third, when Marshall and Manuel linked their religious critique of contemporary America to an interpretation of American history, they effectively backed themselves into a corner that made it impossible for them to admit historical errors. Any mistakes in their historical interpretation of the American past would seem to weaken their religious interpretation of the American present. I cannot emphasize this too strongly: This is a predicament no Christian historian should ever be in. The truth of Christianity and the authority of Christian principles are not on trial when we debate American history. Tagged C. S. Lewis, Christian history, David Manuel, Light and the Glory, Peter Marshall Jr.
Before moving on to other things, I want to share one more passage from the writings of C. S. Lewis that I appreciate as a historian. As I have shared in the previous three posts, even though Lewis was a specialist in ancient and medieval literature by training, he had some remarkable insights into the nature of history. Although I just wrote “even though” (as if Lewis’s training in literature was a hindrance to historical thinking), the more I think about it, the more I am convinced that Lewis’s historical insights were a result of his training in literature, not in spite of it. To begin with, because he specialized in very old literature, Lewis was constantly faced with a challenge that every history teacher knows well, namely the difficulty of convincing a present-minded society that we have much to learn from previous ages. Of necessity, he perfected a persuasive case against what he liked to call “chronological snobbery.” Second, his immersion in stories helped him to appreciate that what we call “history” is not the past in its vast totality but instead the stories (hopefully true) that we tell about our pasts as we try to make sense of our lives and of the world around us. Lewis’s appreciation of history as story comes through powerfully in his essay “Historicism,” which I alluded to two posts ago. In “Historicism” Lewis takes on those amateur students of history (most commonly politicians, pastors, and pundits) who are convinced that they can, “by the use of their natural powers, discover an inner meaning in the historical process” or discern the ultimate historical meaning of particular historical events. From Lewis’s perspective, any attempt to do so apart from divine revelation is a fool’s errand. The historian rightly does his or her best to determine what has happened in the past, to explain what has happened, to evaluate what has happened, perhaps even to suggest how to learn from what has happened, but the historian, as a historian, must not try to tell us the ultimate meaning of what has happened. To do so, Lewis insists, is at worst “positively mischievous,” at best a “waste of time.” Why does he think so? To understand the answer, we start with Lewis’s appreciation of history as the story of humanity. As someone whose professional life was given to interpreting and constructing stories, Lewis knew that the significance of any character or action in a story is determined by the story’s overall plot. As an example, he imagined discovering a six-line fragment of a lost Greek play. We might be intrigued by the mention of an action or a character, but without a clear sense of the plot of the play we would not know what significance to attach to either. When we study history, we find ourselves in much the same situation. At its broadest, we study history in order to gain greater understanding into our own place and time. Fighting our narcissistic tendency to see the world as revolving around us, the study of history challenges us to situate our brief sojourns on earth within a far larger story, the unfolding drama of the human race. But what is the plot of that larger story? Apart from divine revelation, Lewis contends, the plot would be utterly unknowable. Like the scholar who stumbles across a mere scrap of a Greek play, we simply don’t have enough to go on. Throughout “Historicism,” Lewis makes clear that what he is criticizing is not the longing to find ultimate meaning in history, but rather the pretentious claim to be able to discern such meaning apart from the revelation of God. As Christians, this should both encourage and convict us. We are encouraged by the reminder that the human story is not simply one thing after another, a meaningless tale without plot or significance. We are convicted when we realize how often American Christians have presumed to proclaim God’s understanding of our nation’s past or His purposes for our future. Such assertions are never historical conclusions, rightly understood. They are prophetic declarations. 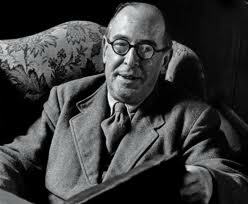 For the past couple of posts I have been sharing some of the ways that the writings of C. S. Lewis speak to Christians interested in history. Lewis is probably best known today for the fabulously popular series of children’s books, The Chronicles of Narnia. Many Christians also know him as one of the twentieth century’s most influential Christian apologists. A half century after his death, Lewis still speaks to truth seekers through works like The Screwtape Letters, The Abolition of Man, and, above all, Mere Christianity. 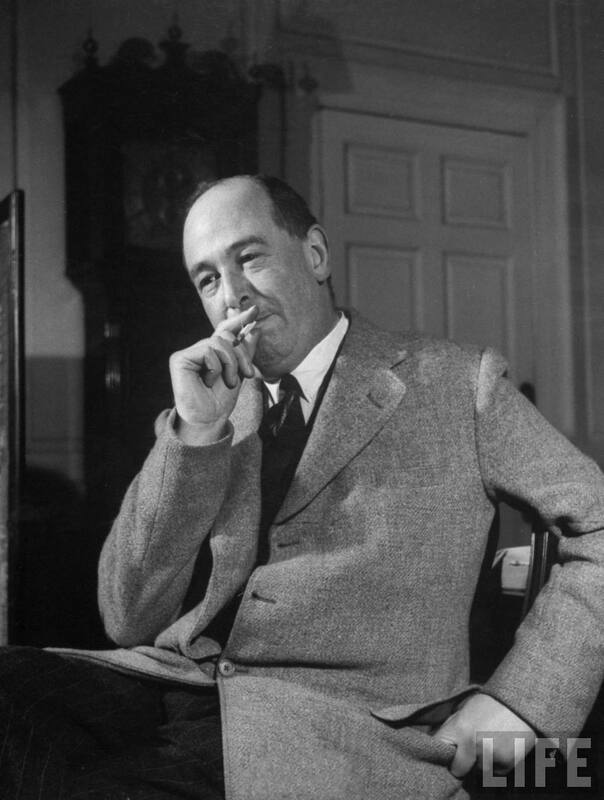 But in addition to being a novelist and Christian apologist, Lewis was also an internationally recognized scholar of medieval and renaissance literature, first for nearly three decades at Oxford University, then for the last years of his life at Cambridge. I think it was Lewis’ passion for old books that more than any other factor accounts for his value to the historian. He knew that the past had something to say to the present, something that the present very much needed to hear. But it was not enough simply to convince his students to read old books; they had to be taught how to read if their conversation with the past was to be life changing. Lewis makes this point marvelously in one of his least known essays, a piece titled “De Audiendis Poetis” (“On Hearing the Poets”) that was found among his personal papers after his death and published posthumously in a collection of his essays (Studies in Medieval and Renaissance Literature, 1966). Lewis begins matter-of-factly: “There are more ways than one of reading old books.” As with his introduction to Athanasius’ On the Incarnation, Lewis’s observations with regard to literature are almost precisely what the student of history needs to hear as well. There are two ways of enjoying the past, as there are two ways of enjoying a foreign country. One man carries his Englishry [great word!] abroad with him and brings it home unchanged. Wherever he goes he consorts with the other English tourists. By a good hotel he means one that is like an English hotel. He complains of the bad tea where he might have had excellent coffee. He finds the “natives” quaint and enjoys their quaintness. . . . But there is another sort of traveling . . . . You can eat the local food and drink the local wines, you can share the foreign life, you can begin to see the foreign country as it looks, not to the tourist, but to its inhabitants. Lewis’s analogy reminds us that when we study the past we can count on encountering both what seems familiar to us and what strikes us as strange. And just as with his hypothetical tourist, our natural tendency is to stay within our comfort zone, to seek out the familiar in the past (or what appears to be so) and camp out there. Is there anything wrong with that? The answer depends on your objective. The English tourist who hangs out with the other English tourists “may have a pleasant time.” But the tourist who immerses himself in the local culture comes “home modified, thinking and feeling as [he] did not think and feel before.” The difference is immense. To be educated is to experience transformation, Christian writer Parker Palmer observes. Authentic education, among other things, always changes who we are. Part of history’s priceless potential is its ability to introduce us to ways of thinking and knowing that challenge and convict us. But unless we are careful, we will ignore the strangeness of the past—those parts that challenge us—and exaggerate the familiar aspects that comfort and confirm. Particularly is this true when we know in advance what we want to find in the past. With all due respect to popular Christian writers like David Barton or the late Peter Marshall Jr., we must be wary any time we study the past primarily to “prove points” in contemporary “culture wars.” When we ransack the past in search of ammunition rather than illumination, we predictably find what we are looking for, but we rob history of its power in the process. History loses its potential to surprise and unnerve us, ultimately to teach us anything at all. We learn nothing beyond what we already “know,” which is another way of saying that our study of the past ceases to be educational. We may have a “pleasant time” on our excursion, but we will come home unchanged. Tagged C. S. Lewis, Christianity, David Barton, history, L. P. Hartley, Peter Marshall Jr.
One of the challenges that we face in trying to think clearly about history lies in the inexact meaning of the word itself. According to the Oxford English Dictionary, history has at least twelve distinct meanings. Many of the listed usages are rare today, but a few are still common. Our tendency to use them interchangeably can get us into trouble. Setting aside the revealing usage when we say that someone or something is “history,” i.e., utterly irrelevant to the present, there are two different phenomena we commonly have in mind when we refer to history. We are probably either thinking of (1) everything that has happened until now, or (2) what is known and taught about everything that has happened until now. These are not the same things, and the difference is not trivial. To help my students differentiate these concepts, I encourage them to speak of all that has happened until now as “the past,” and to reserve the term history for our efforts to make sense of the past. (I like the wording of the Christian historian John Lukacs, who refers to history as “the remembered past.”) The first and single most important step to thinking historically is coming to grips with this fundamental distinction between history and the past. Each of us finds that in his own life every moment of time is completely filled. He is bombarded every second by sensations, emotions, thoughts, which he cannot attend to for multitude, and nine-tenths of which he must simply ignore. A single second of lived time contains more than can be recorded. And every second of past time has been like that for every man that ever lived. The past . . . in its reality, was a roaring cataract of billions upon billions of such moments: any one of them too complex to grasp in its entirety, and the aggregate beyond all imagination. By far the greater part of this teeming reality escaped human consciousness almost as soon as it occurred. None of us could at this moment give anything like a full account of his own life for the last twenty-four hours. We have already forgotten; even if we remembered, we have not time. The new moments are upon us. At every tick of the clock, in every inhabited part of the world, an unimaginable richness and variety of “history” falls off the world into total oblivion. This distinction between history and the past has numerous implications for thinking historically. We can delve into those at another time. For now, I want to stress how the distinction is critical to our ability to think Christianly about our efforts to understand the past. “As a man thinks, so he is,” the Psalmist wrote. It would be an oversimplification to say that what we think reflects our hearts and how we think shapes our hearts, but I think there is more than a grain of truth to the generalization. On the other hand, when we recall that there is One, the Architect and Lord of history, who comprehends the incalculable expanse of the past perfectly and exhaustively, our natural response should be one of reverence and awe. With the psalmist we drop to our knees and declare, “Such knowledge is too wonderful for me” (Psalm 139:6). If we desire to think Christianly about history, nothing will promote that goal more than keeping in mind the distinction between history and the past. For the Christian student of history, no truth more powerfully promotes a dual appreciation of human limitation and divine power.